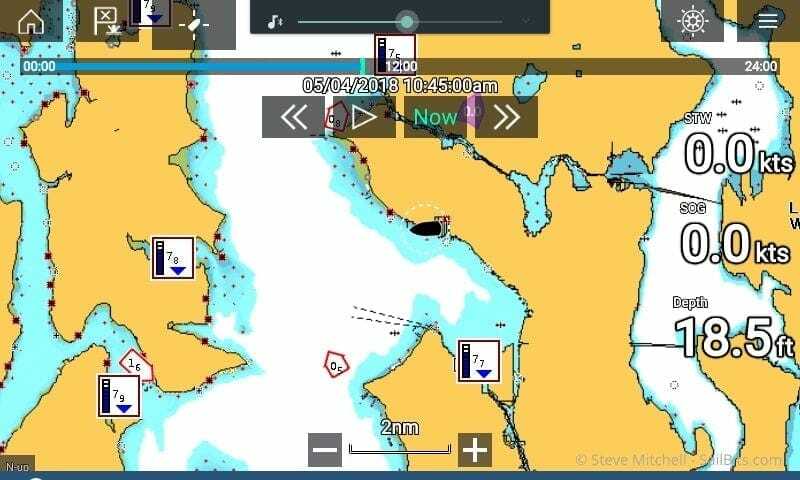 Raymarine continues their updates for Lighthouse with version 3.4 which includes a number of new features, bug fixes, and features that we had in version II. There are more useful features and changes in this release than the last few, which were mostly playing catch-up with missing items from Lighthouse II. The most exciting addition is apps for Netflix, Spotify and Theyr, and the promise of even more in the future. 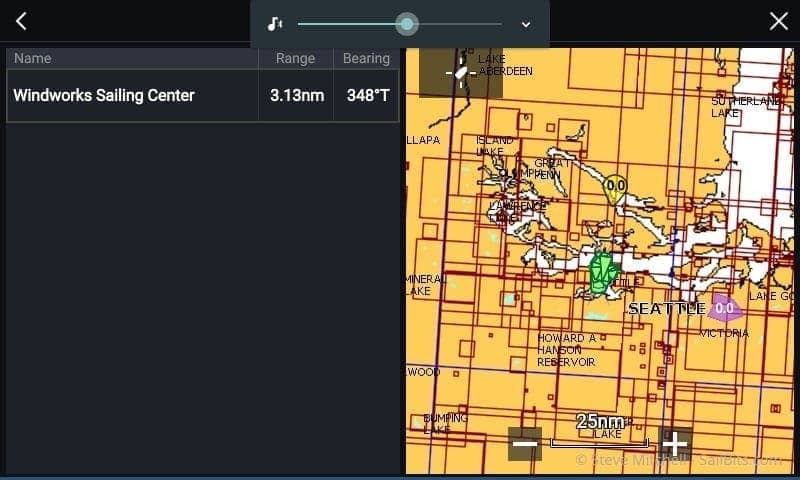 Check out our articles on the initial Axiom review and Lighthouse 3.0, v3.1 autopilot goodness, v3.2 with Navionics and Fusion audio support, and Lighthouse 3.3 – radar and AIS plus more. This is probably the biggest feature released in Lighthouse since support for the Axiom hardware platforms, and the general rework to the Lighthouse system. 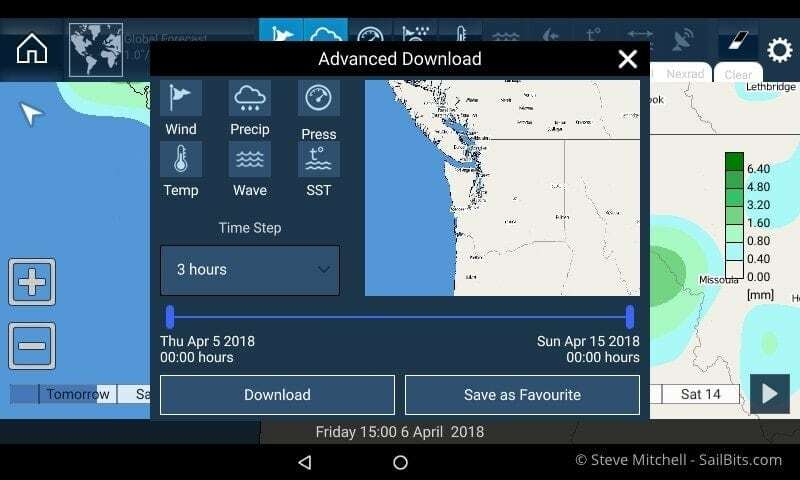 The Bens over at Panbo covered this when Raymarine announced it at the Miami Boat Show, and other manufacturers have thrown their hat into the ring of providing app or HTML based access to things other than traditional charts and MFD functions. 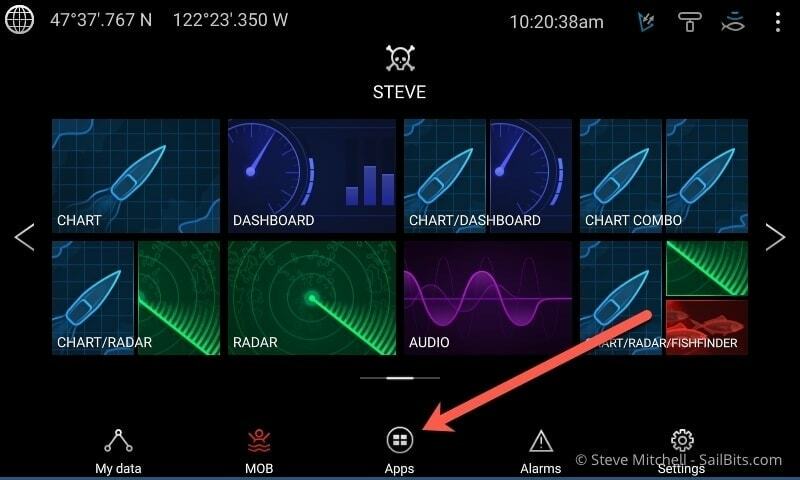 Raymarine’s approach appears to be based around the fact that their operating system is running a derivative of Android, which is used on many phones and tablets. 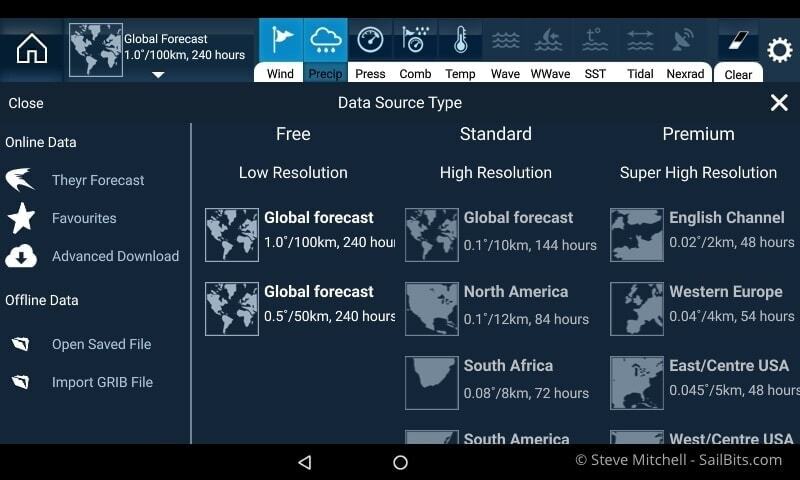 Their apps appear to be Google-Play-store-like, although based on Raymarine forum responses such as this, don’t expect that you can get your apps that way – they appear to still only be available via software updates provided by Raymarine. 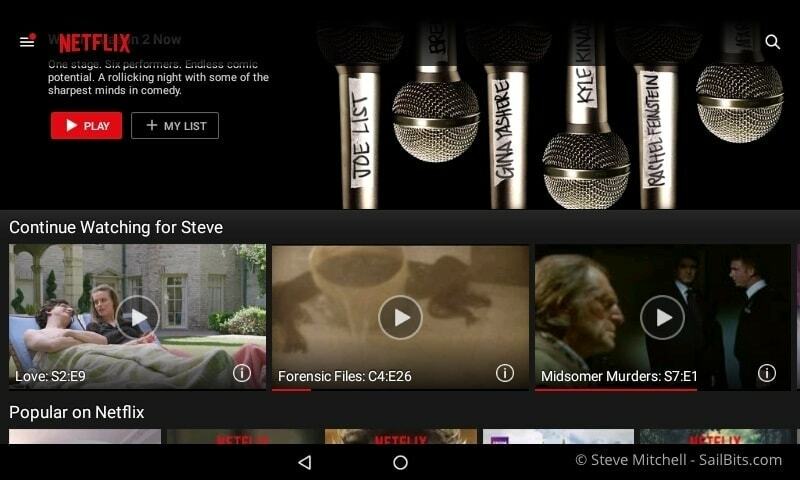 The first three apps available as of v3.4 are Netflix, Spotify and Theyr. 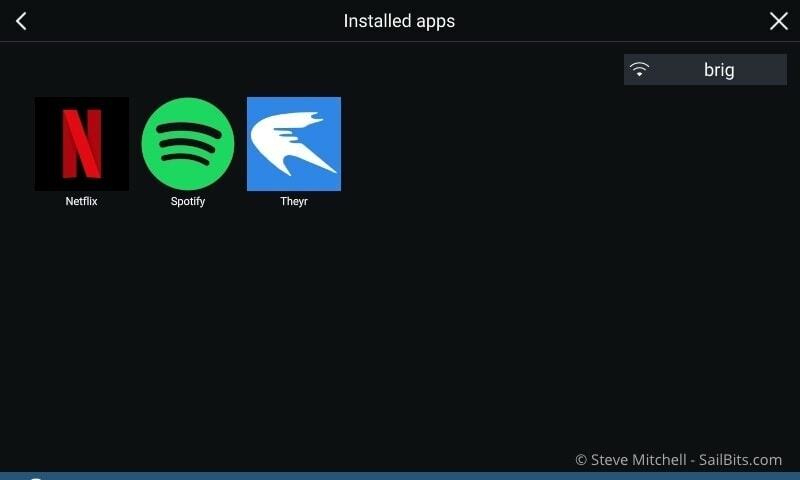 All three of these apps require an internet connection, so make sure you setup your WiFi connection in the settings part of your Axiom before you try to use them. When talking to people about Netflix on a chart plotter, I have found there are two camps: the purists who pull their hair out and are freaked out that you would be watching a movie when you should be navigating, and the (usually crew) folks who think it would be great to relax in the cockpit and catch up on their latest show. I think that is a great reaction – such polarized opinions shows this feature is something new that bucks the trend. 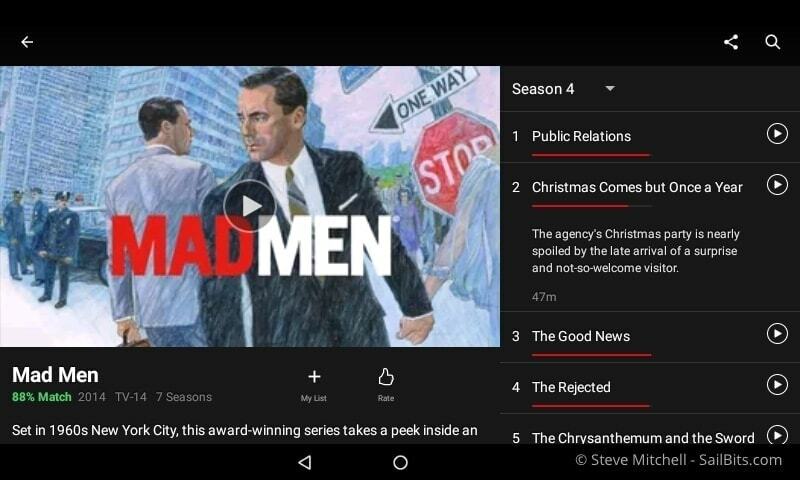 Once you login to Netflix, you’re presented with your usual home screen, and all of the controls you’re used to. However, to hear anything you will need to pair your chart plotter with a Bluetooth device of some sorts – I used my Fusion radio. Controls inside of an individual show are very similar to Android tablets/phones, and work reasonably well. I tried to take some screen shots of video playing and the controls therein, but they all came out blank, which I assume is some sort of copyright protection that Raymarine had to add. Things can sometimes be hard to control, such as scrolling forwards or backwards in an episode, and there were a few delays when I hit play/pause and then hit it again thinking things weren’t working. All of the other normal Netflix functionality is there as far as I can tell. Someone asked on Instagram about offline mode and whether you could download episodes while connected for use when offline later, such as on long passages, etc. I haven’t seen that option anywhere in the interface, but I will keep searching. Half the time, I think having Netflix is a pretty cool feature – if we’re at anchor or the dock, and everyone is enjoying the cockpit and the sun, we could flip up the latest episode of Below Deck and see what shenanigans are going on. But it is a pretty small screen compared to the TV belowdecks. One of my crew asked if I could revert back to paper charts for all navigation so they could watch TV all the time, even underway – we won’t be doing that! The other half of the time I wonder how many people will really use it – perhaps in a sailboat with one display it might get used, but in a larger power boat, chart plotters tend to be at driving stations, which aren’t the places people hang out once you’re done driving. Any way you cut it, if you like it or hate it, its a new interesting feature, and I love anything new because it fosters change. 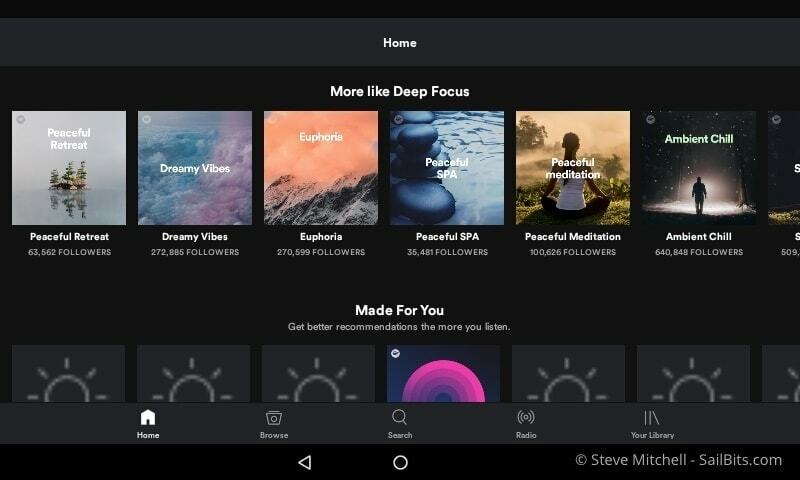 Spotify is one of the primary ways I listen to music, so I was glad to see it supported here. In order to use it effectively though, you’ll likely want to pair your Axiom to a Bluetooth sound device of some sorts. I chose to use my Fusion RA70 stereo, and you can read more below about the Bluetooth feature. 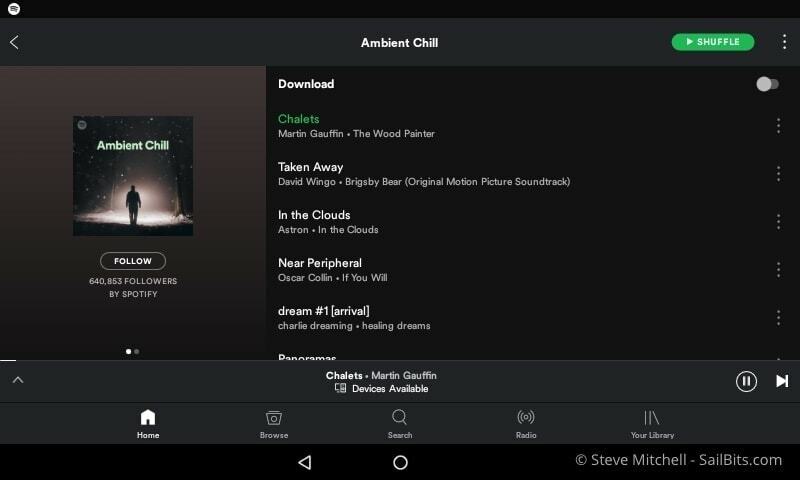 However, you can also use Spotify’s “Devices Available” feature to send the audio stream to other connected devices like an Amazon Echo or Sonos speakers, both of which I have on the boat. We generally always use the Amazon Echo paired to our Fusion stereo to play music so that crew members can “yell” at her if they don’t like the song. This will allow us even more control over the music from outside at the helm station, and maybe reduce the yelling. 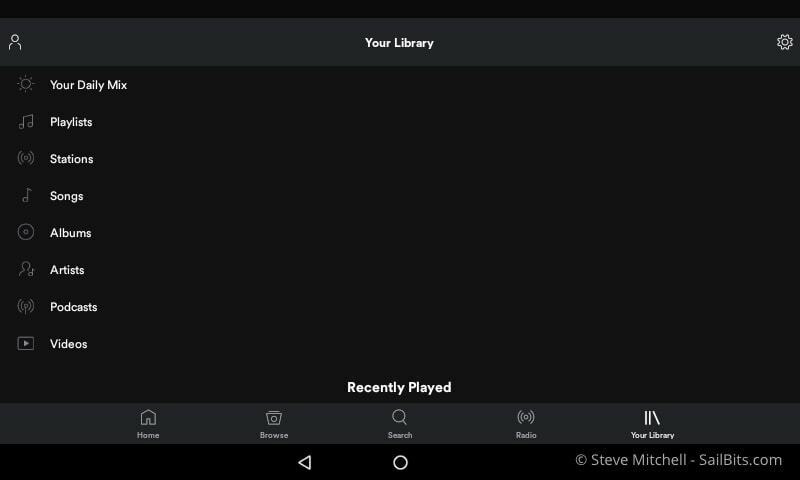 Spotify works just like it does on all of the other devices I have. You have access to your library, browser, search, radio etc. 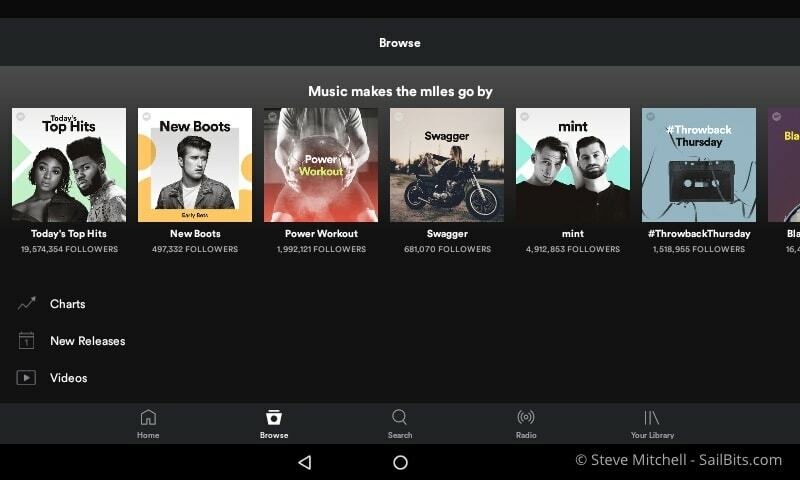 It also continues running in the background when you exit the app unlike the other two apps, so your music continues to play. 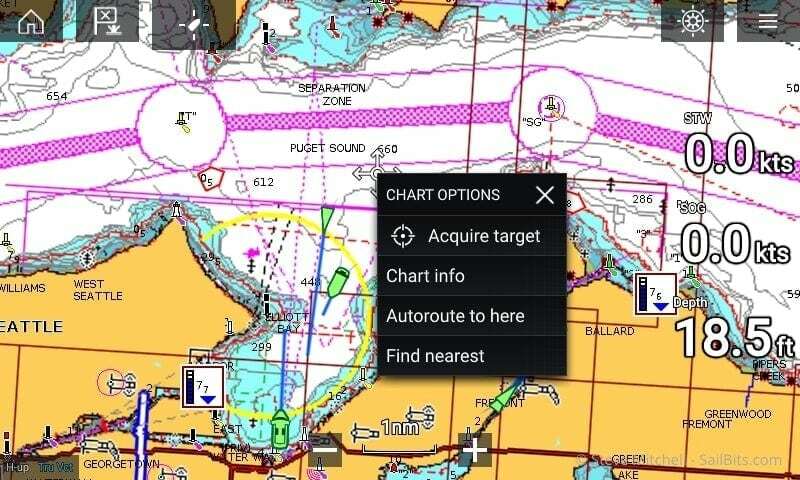 That is an important point, as it means that Raymarine have had to test to make sure Spotify doesn’t freak out other parts of the chart plotter – we don’t want navigation or autopilot control to stop working because of a music problem! It also is likely one of the main reasons they intend on certifying and testing apps rather than just letting folks download whatever random app is available in the Google Play Store. Having your chart plotter slow down or crash because of some mis-behaving app likely won’t make people happy. Navigation is nice on a wider screen, and the app seems extremely responsive and easy to use. I didn’t notice any stuttering or weird behavior. 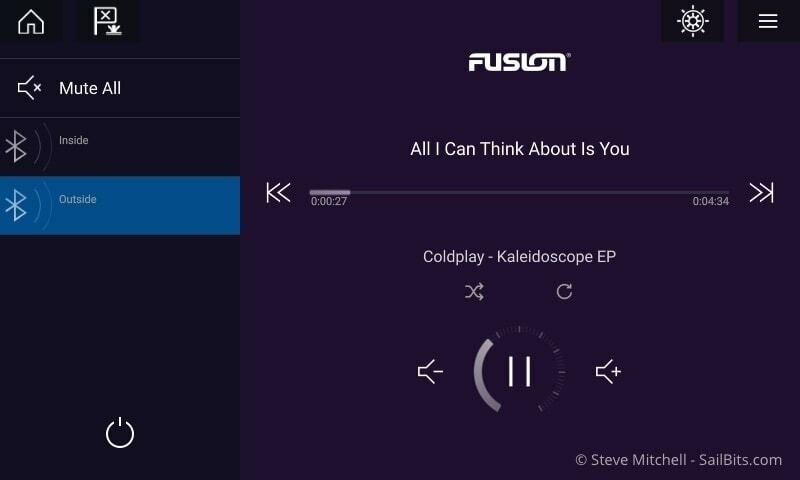 Because I paired my Axiom to my Fusion, I could also flip over to the Audio screen on the Axiom and see the details on the song that was playing, being shared via Bluetooth data, and control the volume in each zone on my Fusion. Nice integration! There are some oddities given that it is laid out like it would be on a tablet, and some wasted space as a result, but that is a small criticism. Theyr has provided high quality weather and ocean forecasts for a long time. 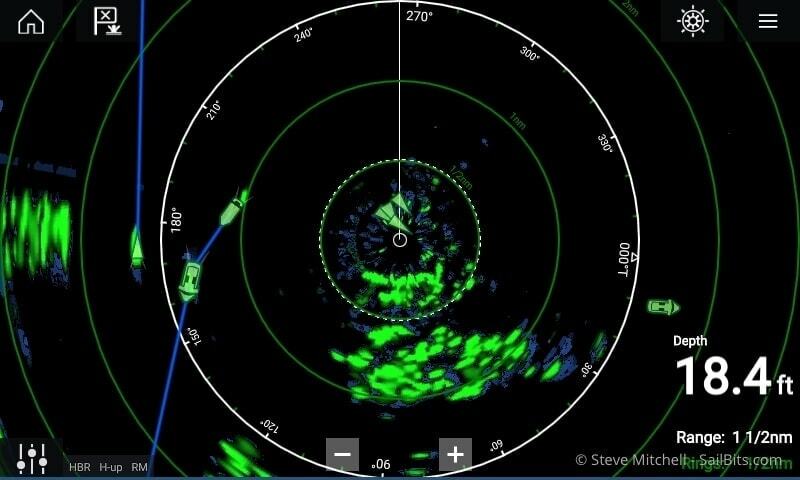 I subscribed to the integration that Raymarine provided in Lighthouse 2.x which downloaded forecasts to the chart plotter and allowed you to scroll through a bunch of different types of forecasts over various time frames. 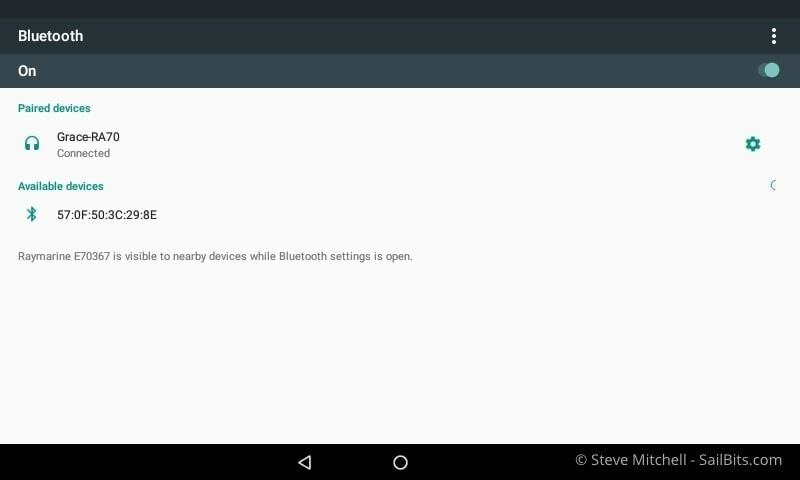 The app provided in 3.4 is a much improved version that includes even more options. 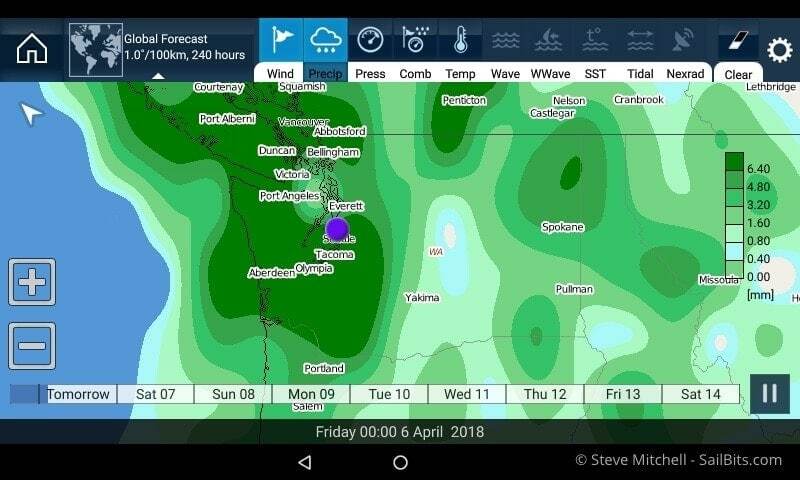 Above you can see the precipitation forecast for the general Seattle area, and you can move forwards and backwards in time (no jokes about it always raining here). 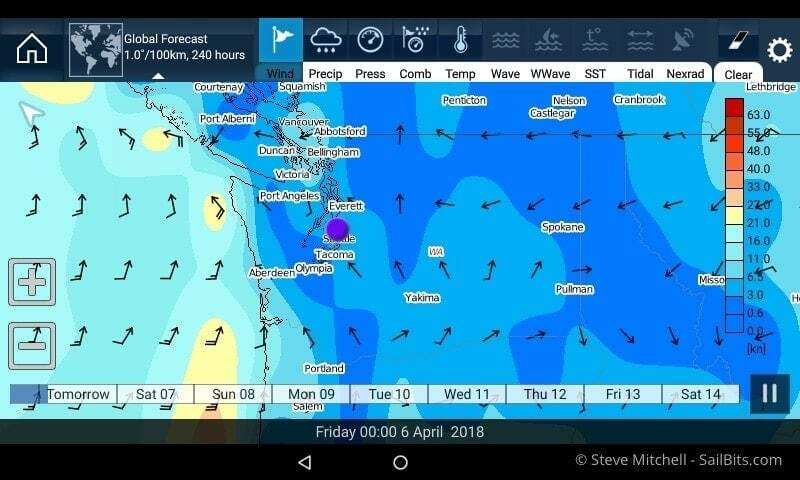 Wind forecasts are also nicely presented and easy to read, just as they are on Theyr’s website. There’s also a lot of granular control over what forecast you want to download, including the types and time step. Keep in mind that this app requires an Internet connection to work, just like the other two. I did also notice some instability with this app, more than the other two. It crashed twice, throwing me back to the main Axiom screen. Several times it froze and then recovered, and was just generally not as reliable as the other two apps. This is listed as a standalone feature, but you really can’t use it without an app. In my testing it is a bit finicky – I had to try a number of times to get it to pair with my Fusion RA70 radio. In addition, once it was paired, the volume control pops up at the top of the screen every 10-15 seconds regardless of what you’re doing, which is very distracting. 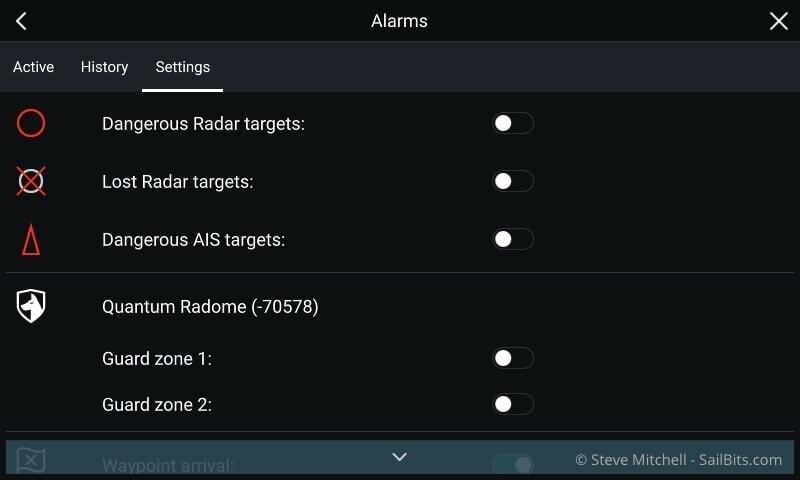 Alarms have been improved – not only can you see a history of past alarms, but on multiple screens and in multiple places, there is an alarm indicator along with a number of alarms, similar to a cell phone app. Digital switching alarms are also present here, if you have those devices aboard. Find Nearest is a new pop-up option on a chart, and helps you find various things that are nearby. There are a bunch of different categories to choose from, and they seem to be driven by the chart you have currently active. In my case, I was testing with Navionics. While others have very few. This is good to have in a pinch if you are looking for something nearby. Most of the time, I use cruising guides, Active Captain, or plan nearby things during my navigation planning, and there are lots of other tools out there for that. This is a pretty straightforward feature, but a nice one if you are trying to figure out tides and currents over time periods. Essentially, it dims everything else on your charts, and only shows tide and current stations. You can go back and forth in time and see how things change, which is helpful. Being able to scroll back and forth in time, and watch the stations change, while also zooming in and out is helpful when planning, or when trying to figure something on the fly that you didn’t anticipate in your navigation planning. This is definitely not a new feature, but rather one that we sorely needed from the Lightouse II days. 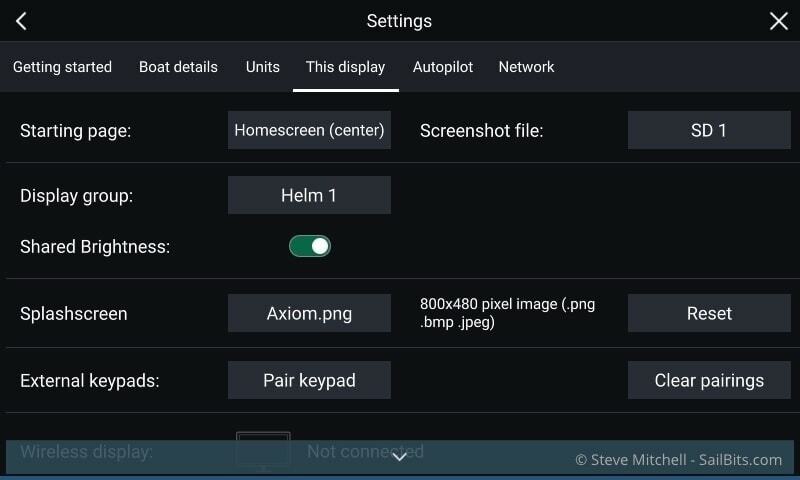 The ability to dim all of your displays from one place is pretty convenient. Now my two i70s and p70s displays are synched with the chart plotter, which is very convenient. I just wish they brought back the night vision colors which every other vendor in the world has. This isn’t likely to be a popular end-user feature, but I suspect for integrators and manufacturers it will be important. You can now add a custom logo to the start up splash screen when you boot up your Axiom. Raymarine released the Quantum 2 radome since the last Lighthouse 3.x release, and this version has support for that hardware. In addition, this version allows for software updates from the Axiom MFD to be pushed to the radome, which has been missing since 3.x was released. They also added some nicer color options – I like the one above a lot compared to the previous ones. 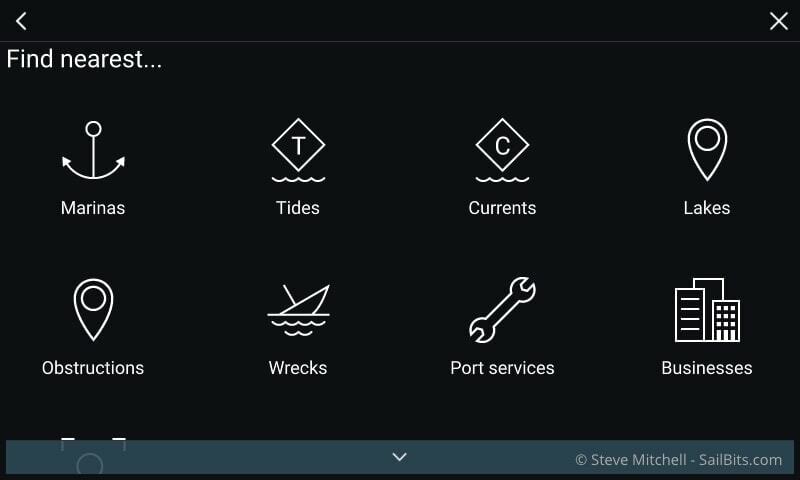 Intermittent Navionics chart networking issue – this also was something I pointed out in my update of version 3.3 which caused connected Navionics apps to not synchronize correctly. In addition, the power button issue that I reported in Raymarine’s forums does appear to be resolved, although it is not specifically cited in the release notes. That is great news, as that bug required power cycling everything to get it back into a responsive mode. There were several others that I wasn’t affected by. eS/gS folks who got 3.3 after waiting 9+ months for v3.x will still have to wait for these features, if they even are delivered to that hardware. I suspect items like Bluetooth support won’t even be possible, unless that hardware has Bluetooth – I forget, but I think you could get a remote control that used Bluetooth, so perhaps not all is lost. 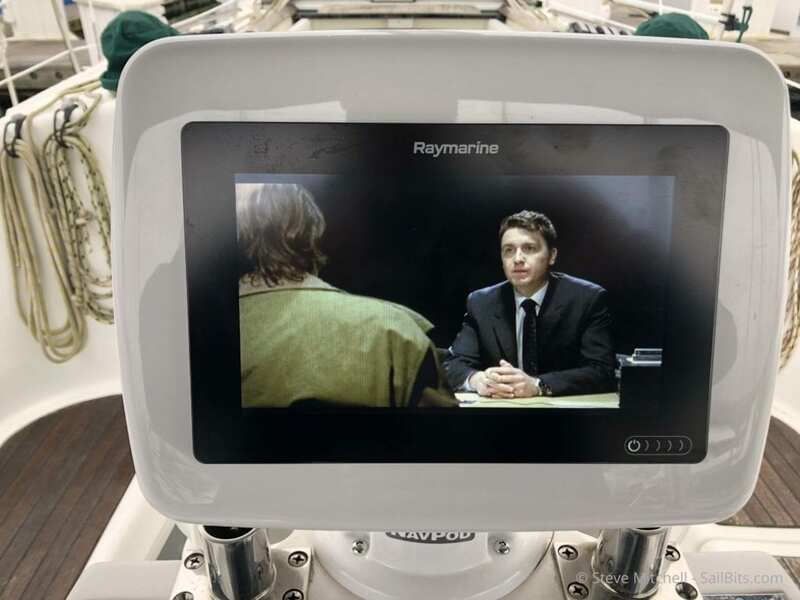 Apps also are pretty intensive, so the older hardware may not run it well, or Raymarine may simply not offer it so that whole situation is avoided. I would hope not, as Apps are likely to be a big growth area. 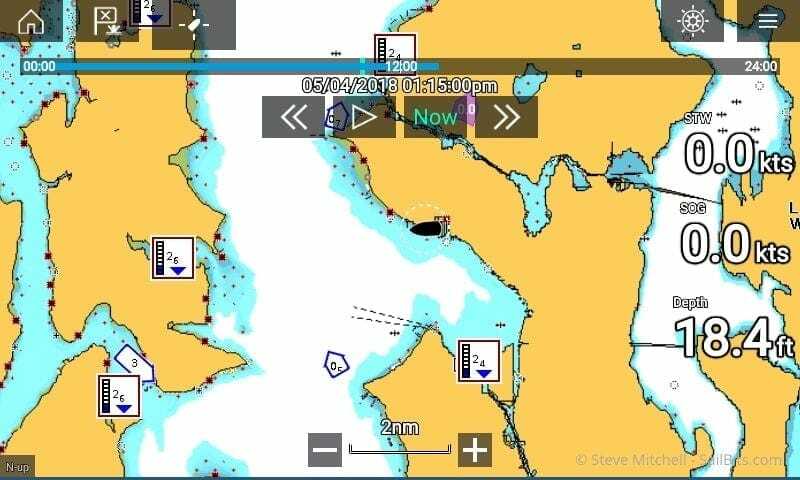 Overall, v3.4 shows that Raymarine is not just playing catch-up with features, but still innovating on the software front. Apps are an interesting new area that I think we will see massive growth from all manufacturers over the next year, and could end up providing some amazing new functionality. Tweaks to existing features that provide more value and cross-connectivity are also good to see. There are still bugs and issues, and still features missing from 2.x, but we’re not even a year into 3.x and the future does seem to be looking good. For the last year or so, I have wanted to build a community focused on marine electronics, networking and technology on boats. In recent discussions with my industry peers at Panbo, and we thought it would be great to collaborate on a dedicated community forum for this purpose. For almost two years I have been testing, re-testing, and re-wiring my setup on Grace in an effort to find the best LTE antenna configuration.